One look at the Spyfire Hoody and you realize it's different by design, construction and features than any other down sweater that has come before it. The Spyfire Series combines unique fabrics, precision design, and thermal body mapping to deliver technical performance and unparalleled style. The soft shell reinforced fabric on the shoulders allows you to carry skis or equipment with sharp edges that would shred any ordinary down sweater. Lightweight underarm knit panels allow heat to escape for better climate control and comfort in a wide range of temperatures. The ethically sourced (non-force-fed/not ‘live-plucked’) 800-fill goose down provides a superior warmth-to-weight ratio. The precision 3D fit naturally follows your body’s shape, and the intricate construction eliminates binding typically found on the inside seams of jackets. 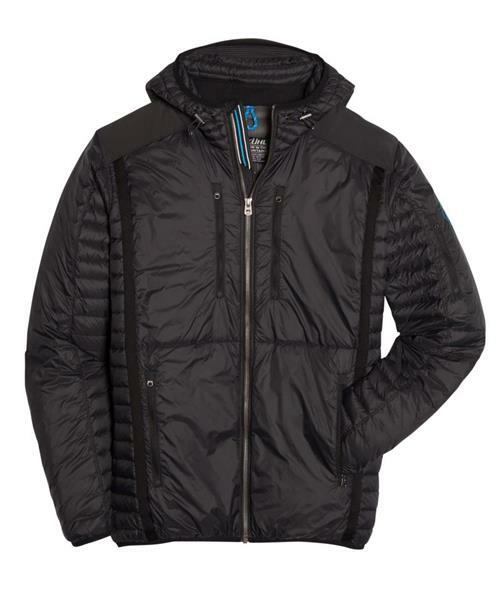 Built with different sized baffles, the Spyfire Hoody boasts superior warmth where you need it. The thinner, sized-down baffles on the inside underarm panels provide a contoured fit and reduce bulk for better layering under a heavier shell. Designed with a 3D brim and multiple adjustments on both the opening and the rear hatband, the signature 5-panel hood provides a custom fit for superior comfort and warmth. When you don’t need it, the hood lays flat. The Spyfire Hoody features 2 zippered chest pockets, 2 zippered hand pockets, 1 zip pocket on the sleeve, and an inside mesh pocket. Custom reflective ribbon below the zippers prevents snags and increases visibility in the dark.